Diana Appleyard wrote a thought provoking piece on the rise of facelifts in the ‘young’. It is true that we all age at differing rates and, thanks to various lifestyle choices, such as smoking and sun exposure, this process can be accelerated – sometimes quite dramatically. Of course surgical intervention is an effective way to reverse early jowl formation, and results are predictable with around 5-10 years longevity. 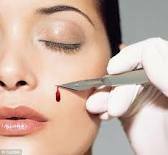 Of course there can be compelling reasons why a woman under 40 undergoes a surgical facelift, but I am very loathe to suggest surgical facelifts for my patients in this age group, especially as there are so many other, good, tried and tested and less invasive alternatives available. I personally believe we are doing our patients a disservice by jumping to surgical solutions. There are many reasons why the non-surgical anti-ageing market is growing – and patients’ expectation has to be one of the main ones. Thanks to health and beauty journalism, women know about no-knife options – and are much more likely to request these than surgery. As health based technological advances continue, the impact on my chosen speciality will grow and I envisage non-surgical anti-ageing options will increase in number and efficacy. It is our role as health care providers and plastic surgeons to keep abreast of these changes, and to be able to offer our patients a full service, embracing no knife solutions – especially in the young.